Another walk from the Eltham Environs Walking Group. The description has you starting a Queenstown Cemetery but as we wanted to have lunch there we began our walk near the St Andrews market. All of the walking is done along sealed and unsealed roads and fortunately they are not busy as there’s not much space for vehicles to pass. We only encountered two cars on our walk and one pedestrian. There are two ways you can go from St Andrews, we chose Dodd Street on the chance there may have been flowers. We didn’t see any but I think even in mid September you would have to go off the road to see them. There are some fine rural scenes with lovely dams; one was quite large and even had a boat in it. Once you reach the start of the Queenstown Cemetery walk near Proctor Street and Black Cameron Road (Point B on the map) there is the option of extending the walk here, or going to the market for a nice lunch. 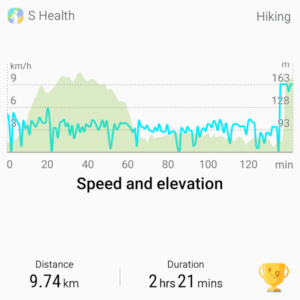 Using the SHealth app that comes with the Samsung S5 a graph is generated of various statistics of your walk. 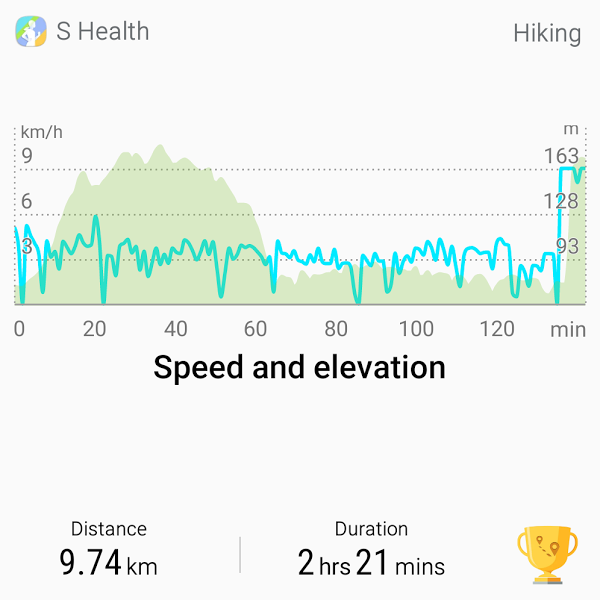 The increase in speed was due to the app counting the quick trip in the car as I forgot to “stop” the walk. From the Eltham Environs Walking Group, walk 15M. Mel 264 G3. Commences at the car park opposite the Queenstown cemetery, and adjacent to the Peter Franke Reserve on Smiths Gully Rd. Walk through the gate, then straight ahead. Cross the creek at Old Caledonia Gully on large stepping stones. Follow the trail along Old Caledonia Gully until Black Cameron Rd is reached. Turn right here, and walk up this steep road to Brens Rd. Turn left and walk to Dodd St. Turn left again. Turn left into Bramalls Rd, right into Shaftesbury Ave, as far as St Andrews. Continue along Dodd St to St Andrews Rd. Note that in mid September, ground orchids are particularly fine in sections of Dodd St. Turn left into St Andrews St, then right into Wallace St. Turn left into Heidelberg-Kinglake Rd (in this section called Caledonia St). Pass the General Store and café, and turn left through the Saturday Market area (toilets here). Continue along Proctor St. Immediately after the creek is crossed, look for the trail along Old Caledonia Gully on the right. Follow this back to the cars. The map from Google Maps. Note that the leg to Queenstown Cemetery is not shown. 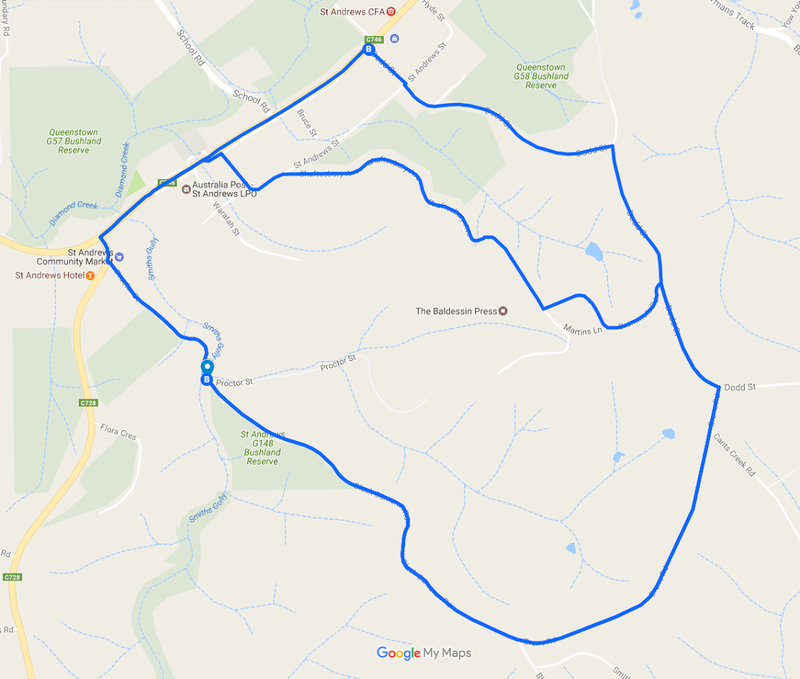 You turn off for it at the western side of the route at point “B”.